Photo 1: The washing bear’s (i.e. raccoon’s) washing days. Get your mopid and švammid now! Puhas is clean and ALE in this context is a Finnish loan-word, ironically just one letter short of the word sale, which is what it means. It is short for the Finnish alennus/myynti (discount selling) and similar to the more widely used alla/hindlus (price reduction), with the key word being alla (down, lowering). So puhas ale means clean/pure savings. Ale is actually a very old Estonian word; it’s a rudimentary farming method, where a field is fertilized with the ash of burned plants/trees – slash-and-burn or fire-fallow cultivation. Photo 2 by Riina Kindlam (2019) Photo 1: Astu sisse. (Step in.) Saad sooja. (You'll get warm(ed up).) 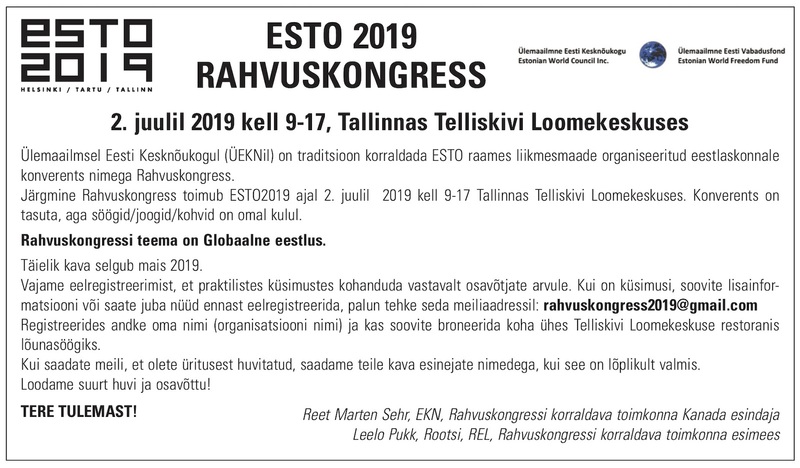 This is the invitation in front of the Joutsen shop on Kaarli pst (puies/tee, boulevard) in central Tallinn. Joutsen is a Finnish company which makes and sells "Northern Light Down" in the form of padjad (pillows), sule/tekid (duvets) and mantlid (coats) filled with udu/suled (literally "fog feathers", down in Estonian). 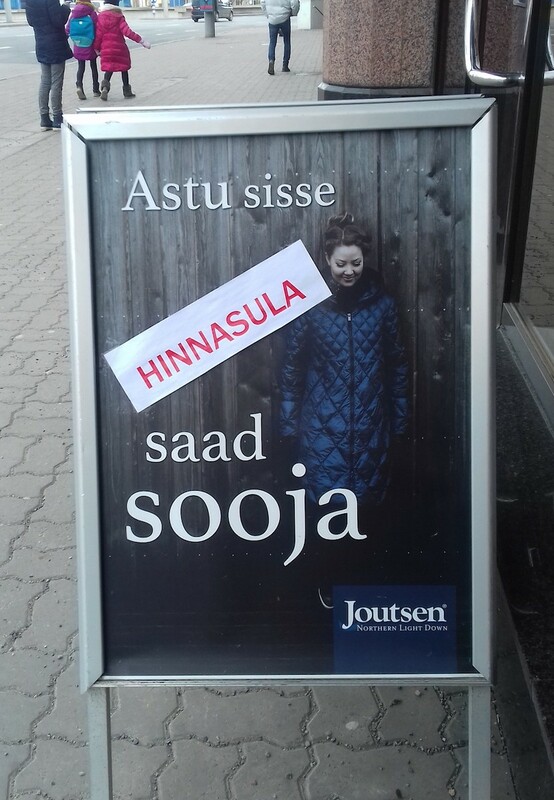 The word slapped across the plakat (poster) in red reads: hinna/sula = price melt/thaw. It's so toasty in there, the prices are melting. If something is very delicious, it can be described (in one word of course) as suus/sulav (melt in your mouth). Another campaign, "Mammuti päevad" (Mammoth Days) are currently on at Rimi supermarkets (Swedish owned) in Eesti; the woolly maskotid of the sale have melted out of the igi/kelts (permafrost) as well, with prices dropped and savings as big as their võhad (tusks), singular võhk. 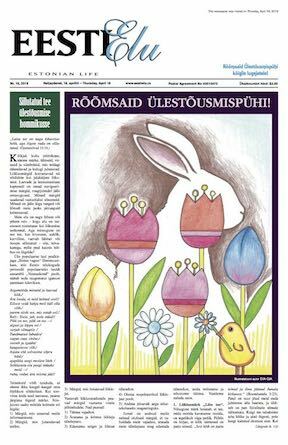 It would be wrong to leave another animal, a non-native in Estonia, but no stranger to readers, unmentioned here, since Pesu/karu puhastus/päevad is the current ad campaign of the Maxima grocery chain (Lithuanian owned). The literal translation of pesu/karu is washing bear and it’s the Estonian word for raccoon. Swedish botanist Carl Linnaeus initially placed the raccoon in the genus Ursus. This, along with the animal’s characteristic behaviour of dabbling for underwater food near shorelines and rubbing food items between its hyper sensitive front käpad (paws), which are protected by a thin horny layer that becomes pliable when wet, has resulting in this misnomer in many languages. 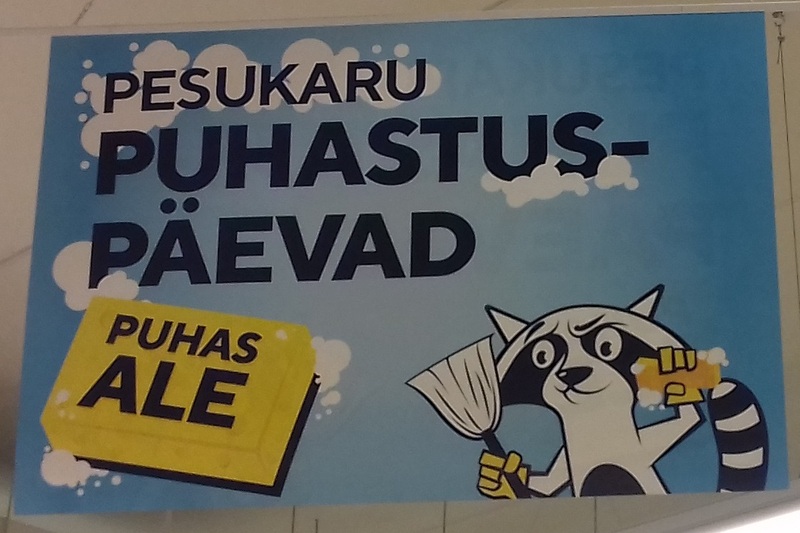 Having a cartoonish “washing bear” with its unmistakable black “mask” and ringed tail, wearing plastic gloves, holding a mopp and inviting you to come to pesu/päevad (washing days) to save on cleaning products, is thereby not a very surprising gimmick. I've never stepped into the Joutsen store ("since 1936"), but it was interesting to read on their website that their down is soley a by-product of meat production; they do not use down or suled (feathers) plucked from living birds. Their pardi udusuled (duck down) comes from France and that of haned (geese) from Prantsusmaa (France), Poola, Hispaania (Spain) and Soome (Finland). Hand-collected haha udusuled (eiderdown) is collected from the Soome saarestik (archipelago) after the nesting season and used in part of the bedding. The eider, a large sea duck, is a HAHK and the possessive case is HAHA, and that's no joke. Bedding is produced in Joutsen's brand new local bedding vabrik (factory) in Riihimäki (Soome) and "down coats are manufactured by our professionals in our modern factory in Estonia." the concept of a duvet cover is as old as the Ttwo) hills in Estonia, albeit originally not to cover fancy down comforters, but all manner of woollen blankets – the infamous teki/kott ("blanket bag").